OnePlus 2 was launched in August 2015, and it came in with a 5.5-inch display, LTE connectivity, 4GB RAM, 64GB internal storage, and a 3300 mAh battery. The OnePlus 2 carried forward the design that the OnePlus One had. It is similar in looks in a way but there was some addition to the camera, including the laser autofocus system. 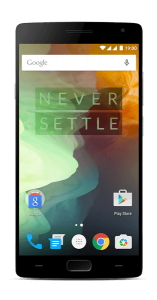 The OnePlus 2 is powered by Qualcomm Snapdragon 810 processor and it has the new OS from OnePlus, the OxygenOS that is a modified Android OS. What was made better than the OnePlus One was the 4GB of RAM included in the OnePlus 2, and a little higher capacity battery as it is a 3300 mAh one inside the successor. Also, the OnePlus 2 has a fingerprint scanner support on the front that also works as a home button. Even though a high capacity battery, the phone does not have the fast charging support. Check below for the full list of specifications of the OnePlus 2. Additional features Fingerprint scanner, USB type C.
Although having 4GB RAM and the Snapdragon 810 along with a fingerprint scanner, the OnePlus 2 got hit with the OS issues, where the confusion was much about OxygenOS vs. Cyanogen OS.